LP STATMAT enhances the reproduction of recorded music by preventing low level voltage surges which affect the signal and therefore the sound quality. This is achieved by an arranged pattern of conductive inks which even out the electrostatic charges which build up as the platter and spindle rotate. LP STATMAT is used on top of the RINGMAT spacers and under the RINGMAT itself. The performance of the system will be dramatically enhanced even further with the use of the new LP BLUE STATMAT and STATCAP. They bring a far greater purity of tone and unimaginable width to the soundstage as well as improving all other aspects of sound reproduction. Whereas the standard LP Statmat is a single layer of our patented conductive film, the LP Blue comprises two Statmat films, one each side of a polyester substrate, and in addition there is a third Statmat film called a Statcap. 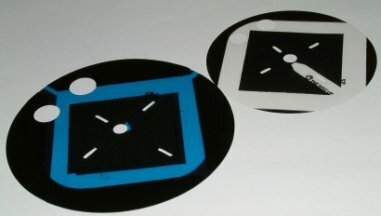 These three antistatic films work together at 90º to each other. The configuration is very much more powerful that way, eliminating all those “clicks” and “pops” caused by static and preventing the record mat from being “stuck” to the underside of the disc when it is lifted at the end of play. There is also a further benefit in using the latest LP Statmat configuration in that unwanted electronic fields arising from playing LP records, which cause phase distortions to the signal, are largely eliminated. The full extent of this problem is not appreciated without doing A/B comparisons with and without the Statmat devices.